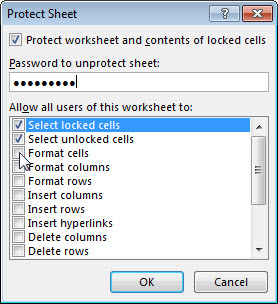 To prevent other users from accidentally or deliberately changing, moving, or deleting data in a worksheet, you can lock the cells on your Excel worksheet and then protect the sheet with a password. Say you own the team status report worksheet, where you want team members to add data in specific cells only and not be able to modify anything else. With worksheet protection, you can make only certain parts of the sheet editable and users will not be able to modify data in any other region in the sheet. Note: Protecting a worksheet is not the same as protecting an Excel file or a workbook with a password. Formulas: If you don’t want other users to see your formulas, you can hide them from being seen in cells or the Formula bar. For more information, see Hide and protect formulas. Ranges: You can enable users to work in specific ranges within a protected sheet. Note: ActiveX controls, form controls, shapes, charts, SmartArt, Sparklines, Slicers, Timelines, to name a few, are already locked when you add them to a spreadsheet. But the lock will work only when you enable sheet protection. Worksheet protection is a two-step process: the first step is to unlock cells that others can edit, and then you can protect the worksheet with or without a password. In your Excel file, select the worksheet tab that you want to protect. Select the cells that others can edit. Note that you can select multiple, non-contiguous cells by pressing Ctrl+Left-Click. Right-click anywhere in the sheet and select Format Cells (or use Ctrl+1, or Command+1 on the Mac), and then go to the Protection tab and clear Locked. Next, select the actions that users should be allowed to take on the sheet, such as insert or delete columns or rows, edit objects, sort, or use AutoFilter, to name a few. Additionally, you can also specify a password to lock your worksheet. A password prevents other people from removing the worksheet protection—it needs to be entered to unprotect the sheet. Given below are the steps to protect your sheet. On the Review tab, click Protect Sheet. In the Allow all users of this worksheet to list, select the elements you want people to be able to change. Move the pointer to cells for which the Locked box is checked on the Protection tab of the Format Cells dialog box. By default, users are allowed to select locked cells. Move the pointer to cells for which the Locked box is unchecked on the Protection tab of the Format Cells dialog box. By default, users can select unlocked cells, and they can press the TAB key to move between the unlocked cells on a protected worksheet. Change any of the options in the Format Cells or Conditional Formatting dialog boxes. If you applied conditional formatting before you protected the worksheet, the formatting continues to change when a user enters a value that satisfies a different condition. Use any of the column formatting commands, including changing column width or hiding columns (Home tab, Cells group, Format button). Use any of the row formatting commands, including changing row height or hiding rows (Home tab, Cells group, Format button). Insert new hyperlinks, even in unlocked cells. NOTE: If Delete columns is protected and Insert columns is not protected, a user can insert columns but cannot delete them. NOTE: If Delete rows is protected and Insert rows is not protected, a user can insert rows but cannot delete them. Use any commands to sort data (Data tab, Sort & Filter group). NOTE: Users can't sort ranges that contain locked cells on a protected worksheet, regardless of this setting. Use the drop-down arrows to change the filter on ranges when AutoFilters are applied. NOTE: Users cannot apply or remove AutoFilter on a protected worksheet, regardless of this setting. Format, change the layout, refresh, or otherwise modify PivotTable reports, or create new reports. Make changes to graphic objects including maps, embedded charts, shapes, text boxes, and controls that you did not unlock before you protected the worksheet. For example, if a worksheet has a button that runs a macro, you can click the button to run the macro, but you cannot delete the button. Make any changes, such as formatting, to an embedded chart. The chart continues to be updated when you change its source data. View scenarios that you have hidden, making changes to scenarios that you have prevented changes to, and deleting these scenarios. Users can change the values in the changing cells, if the cells are not protected, and add new scenarios. Optionally, enter a password in the Password to unprotect sheet box and click OK. Reenter the password in the Confirm Password dialog box and click OK.
Make sure to use strong passwords that combine uppercase and lowercase letters, numbers, and symbols. Weak passwords don't mix these elements. Passwords should be 8 or more characters in length. A passphrase that uses 14 ore more characters is better. It is critical that you remember your password. If you forget your password, Microsoft CANNOT retrieve it. How can I tell if a sheet is protected? The Protect Sheet option on the ribbon changes to Unprotect Sheet when a sheet is protected. To view this option, click the Review tab on the ribbon, and in Changes, see Unprotect Sheet. Go to the worksheet you want to unprotect. Go to File > Info > Protect > Unprotect Sheet, or from the Review tab > Changes > Unprotect Sheet. If the sheet is protected with a password, then enter the password in the Unprotect Sheet dialog box, and click OK.
For more information, please visit the Excel help center.